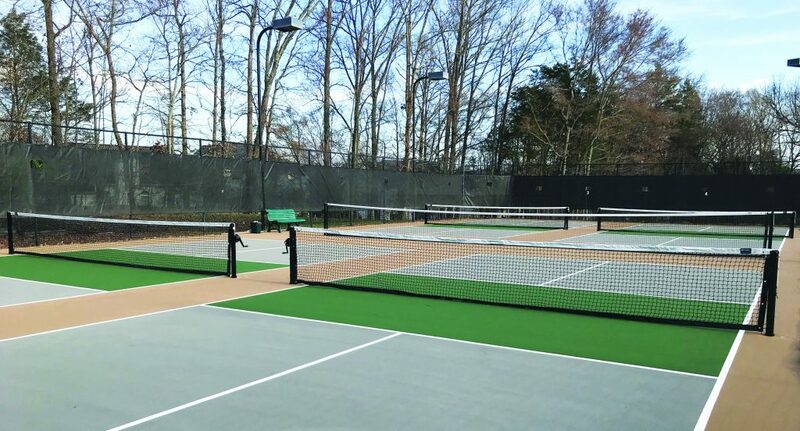 Work has been completed on the transformation of tennis court #6 at Clarke Creek Park into four permanent, dedicated Pickleball courts. Please come out to take a look and play a quick game. Click here to reserve a court. The courts do have lights so you can play in the evening as well. What is Pickleball? Pickleball is a paddle sport created for all skill levels and ages. The rules are simple and the game is easy for beginners to learn but can develop into a quick, fast-paced, competitive game for experienced players. Players can wear just about anything that is comfortable and allows you to move freely around the court. Comfortable court shoes are a MUST for your safety. Court shoes are shoes for tennis, basketball, volleyball and/or racquetball. Sneakers, running shoes or other street shoes do not provide the right kind of support necessary for the quick side-to-side movement and can result in injuries. Eye protection is also recommended. Pickleball adult open play is scheduled for Mondays 9:00am – 11:00am and Tuesdays 6:00pm – 8:00pm. All Pickleball courts are reserved for open play during these times. What is Open Play? Open Play is the term used in Pickleball to designate playing times that are open for players of all skill levels and ages to have fun playing Pickleball. Basically Open Play is Social Play, where the primary purpose is to meet people, make all skill levels feel welcome and enjoy playing this game. As a community with lots of new players, open play is a way to help players learn and improve their game and grow the sport in our area. No sign up is required. Just come out, meet fellow players and enjoy a friendly game (or games). Everyone gets the opportunity to play. Please respect the rotation of play. Be willing to play with all players regardless of age and skill level, when it is that player’s turn to play. Be willing to coach players on rules and strategies. Respect players’ physical and skill limitations and adapt your game to be inclusive. Wear appropriate clothes AND shoes. Bring your own paddle and balls. Other players may have extra paddles but it is not guaranteed. HAVE FUN and MEET NEW PEOPLE! Copyright © 2018 Highland Creek Community Association, Inc.